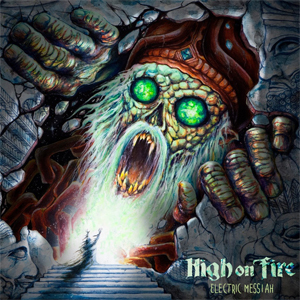 HIGH ON FIRE releases a new single today titled "Electric Messiah". The new song serves as the title track off the band's all-new LP, which will be released on October 5, 2018 via Entertainment One (eOne). Check it out below. “I had a dream about Lemmy,” says Matt Pike, explaining the inspiration behind the title of HIGH ON FIRE’s triumphant new Electric Messiah. “When Lemmy was still alive I always got compared to Lemmy,” the gravelly-voiced guitarist elaborates, “so I had this dream where he got pissed at me." Electric Messiah will serve as the follow-up to Luminiferous released in 2015, which went on to be one of the band's most critically acclaimed albums. NPR said about Luminiferous, "For HIGH ON FIRE to exude this much vigor 17 years into its existence only reaffirms the band's mastery of the form." Pitchfork called the collection of songs "among the most enthusiastic and bracing of the Oakland metal band's career." Finally, Rolling Stone said it was "a ferocious blast of charging guitars, blasting drums and Pike's inimitable hoarse roar" in their feature outlining the 20 Best Metal Albums of 2015. "Steps of the Ziggurat/House of Enlil"
"The Witch and the Christ"